Govt extends the time limit for filing intimation for Composition Levy (filing of intimation FORM GST CMP-01) up to 16th August, 2017; The period of applying for Cancellation of Registration is being extended up to 30th September, 2017. 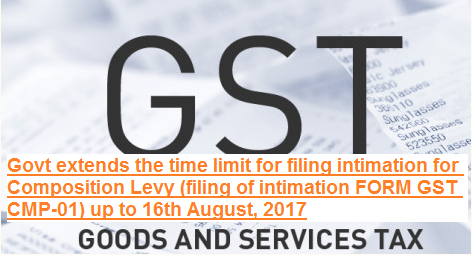 To address the concerns of taxpayers arising from Transition to the GST regime, the Government decides to extend the time limit for filing intimation for Composition Levy (filing of intimation FORM GST CMP-01) up to 16th August, 2017; The period of applying for Cancellation of Registration is being extended up to 30th September, 2017. The Government is mindful of the concerns of tax payers, especially the small taxpayers, arising from transition to the GST regime from 1st of July, 2017. With a view to ease the compliance burden of provisionally migrated small taxpayers opting to pay tax under the Composition scheme, it has been decided to extend the time limit for filing intimation for Composition levy (filing of intimation FORM GST CMP-01) up to 16th August, 2017. Similarly, the taxpayers who were provisionally migrated by virtue of being registered under the existing laws, but who are no longer required to be registered under GST, the period of applying for Cancellation of Registration is being extended up to 30th September, 2017. Relevant notifications are being issued. Government decides to extend the time limit for filing intimation for Composition Levy (filing of intimation FORM GST CMP-01) up to 16th August, 2017; The period of applying for Cancellation of Registration is being extended up to 30th September, 2017.